This program allows you to look at how a computer uses a byte of memory to store decimal, hexadecimal, octal, binary, ASCII, and color attribute values. Very educational. provides a brief tutorial in the appendix. default if your display adapter is not a CGA. information about bytes and bits. the operations of this window. clicking the mouse on the desired item. to move the highlight to any of the eight bits. Press the Home key to move the highlight to bit 0.
the highlight to bit 7 (the left-most bit). backwards, or decrement the byte value. Pressing the Delete key will switch all of the bits to off. bit is 0, it becomes 1, if it's 1 it becomes 0.
with the right-most bit dropping off at the end. Press Shift-left to reverse the direction. one of the following commands in the command window. because decimal is assumed by default. 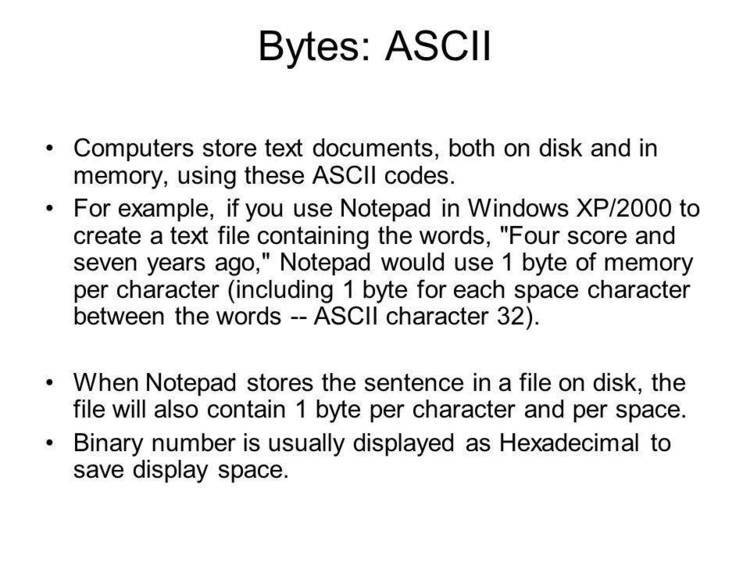 This makes the byte value 97 (the ASCII value for "a"). Byte makes it easy to read a value in your computer's memory. will be set to the value at the new memory location. You can also increment or decrement the current address. address. This has the effect of reading every 16 bytes. called bits to store information. the boxes, all you would have left is a row of zeros and ones. we can say that 00000000b is how we write 0 in binary notation. The b is added to indicates that it's a binary number. (2 * 2 * 2) to the total value of the byte. bits and observe the decimal value change each time you do. PgUp key repeatedly. This increments the value of the byte. Notice both the decimal and bit values as Byte counts. contains the character's color attribute. see in the color attribute window. monitor, bit 0 by itself, shows underlined characters. Underlined characters aren't available on color monitors. left and adding the two together. efficient than the method used.